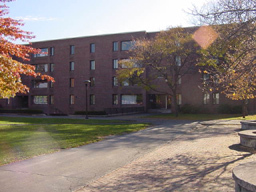 Sharp Hall is located next to the tennis courts and is air cooled. It houses 94 second year students in 16 suites. Sharp Hall is undergoing renovations during the summer of 2008. 12 suites has six single bedrooms, a large bathroom, and a communal living room. Two suites are ADA accessible and containg five single bedrooms, a large bathroom, a communal living room, laundry facilities, and a kitchenette. The basement area of Sharp Hall has a kitchen area and laundry facilities.